CASA . RABAT. TANGER. TETOUANE. CHAOUEN. MEKNES. FES. ARFOUD. RISSANI. ZAGORA. Arrival at the airport Mohamed V transfer to the hotel in Casablanca, Check in, visit the Hassan II Mosque erected at the seaside then visit the corniche of Ain Diab and a city tour, visit the lighthouse. El-Hank in the medina and places Mohamed V and the United Nations. Back to the hotel, dinner and overnight. Breakfast and departure for Rabat. Administrative and political capital of the country, visit the Hassan tower, then the royal palace a break on the oudaya coffee, then visit the Kasbah Oudaïa, overlooking the estuary of Bou Regreg. Free lunch then continuation of the visit of the city, this time on Chellah, ancient Roman city, then finish the visit on El Oulja, Return to the hotel diner & night. Breakfast, Departure to Tangier, visit the archaeological site of Lixus visit the caves of Hercules. We will continue our route to Tangier. Visit of Tangier Bay, free lunch then continue the discovery of the city, visit the former palace of Sultan Moulay Hafid, tea break on the cafe Alhafa terrace built in 1929. Dinner and overnight at the hotel. Breakfast, Departure to Tetouan, white city located on the flanks of Djebel Dersa. 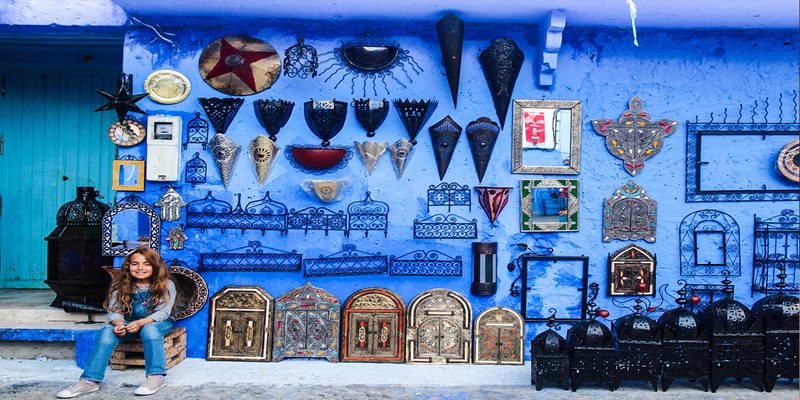 Visit the Tetouan Medina to discover graceful Hispano-Moorish aspects with its souks, its vaulted passages, its charming squares lined with white houses. Then continuation to Chefchaouen to cross the medina, lunch free. Late afternoon free. Dinner and overnight in Chefchaouen. Breakfast, departure to Meknes, crossing the Rif Mountains, Meknes the capital of the Alawite Sultan Moulay Ismail, free lunch then a walk in the medina will lead you from the ramparts and the door Bab el Mansour to el Hedim square closed on one side by the Dar Jamaï Palace, which houses the Museum of Moroccan Art, Agdal Basin, dug at the request of the Sultan for the irrigation of the royal gardens finally visit the Bou Inania madrassah. Dinner and overnight at the hotel. Breakfast, departure to the city of Fez, visit Volubilis. The opulence of this city, former capital of the Roman province of Mauretania Tingitane, departure to Fez, free lunch, visit of Fez el Jedid. Walking on the main street of the old Mechouar to Mellah, the Jewish quarter, we can admire its three mosques: Jama el-Beida, Jama el-Hamra and Jama al-Azhar, admire the usual costumes and objects typically fasi at the Dar Batha Museum. Dinner and overnight in Fez. 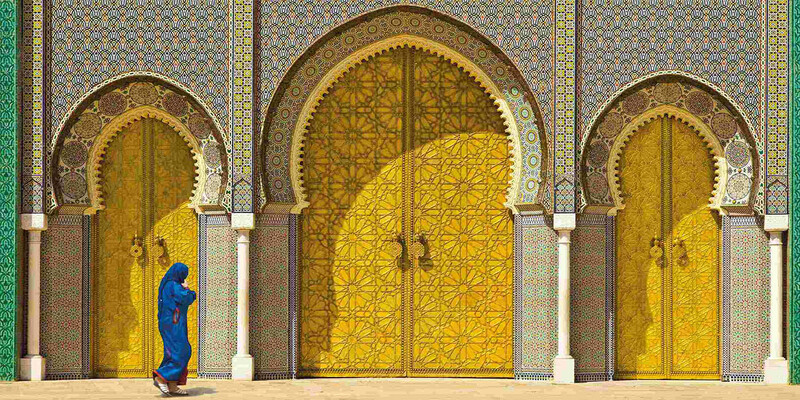 Capital of the Idrissides, Fez is one of the most beautiful cities of the Islamic world, a real jewel sheltering the most beautiful jewels of Hispano-Moorish art. From the top of the ancient merinids necropolis discern its different neighborhoods and evoke its long history. In Fez el-Bali, artisans are still grouped by neighborhoods. This walk will take us from the neighborhood of Andalusians, through tanners, to the district of Karaouyine. After lunch, we will visit the souk Attarine where we will see, among others, the medersa el-Attarin, built in the fourteenth century. We will also see the very large El Qara-wiyyin mosque and visit the zaouïa Moulay Idriss, true sanctuary of Fez. Dinner and overnight in Fez. 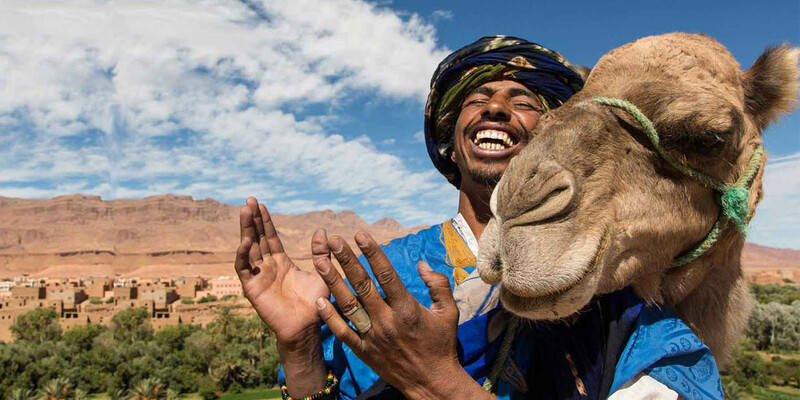 Breakfast and departure to Efroud, Break on the Ziz valley, Arrival in Erfoud check in the hotel lunch on site, after change of vehicle 4 * 4 and departure to Merzouga to witness the sunset in the dunes of the Sahara on the back of dromedary to savor all the magic of the great South. Dinner included with animation. Return to Erfoud by 4 * 4 overnight at the hotel. Breakfast, Departure to Rissani visit the mausoleum of Moulay Ali Cherif and the ksar Abbar, beautiful example of earthen architecture of the great South. After lunch, departure to Zagora, which was a junction point between the main trans-Saharan caravan routes and which occupies since the Almoravids this same function of crossroads between the world of the desert and that of the rich valleys of the Atlas. Dinner included. Night in Zagora. Breakfast, departure to Ouarzazate, on the road to the Draa Valley, dotted with ksour, overlooking lavish landscapes, to Ouarzazate. Free lunch. Visit of the cinema studio, (if there is no filming) After the visit of the kasbah of Aït-Benhaddou, superb scenery as arose from sands and ocher lands, that of the kasbah of Taourirt, erected at the gates of the city , will give us the opportunity to evoke the French protectorate and the role of glaoui, pasha of Marrakech, who had there one of his favorite homes. Dinner and overnight in Ouarzazate. Breakfast, departure to Taroudant, capital of the Saadian dynasty from 1520 to 1541, Taroudant is now an important market. Go around the ramparts before strolling through the lively souks. After free lunch, departure to Agadir we will discover during a quick tour of the city, completely rebuilt after the earthquake of 1960. Dinner and overnight at the hotel. Breakfast, Departure to Essaouira while following the Atlantic coast, we will join Essaouira, the old Mogador of the Portuguese, has kept all the charm of yesteryear: the port, the ramparts, the sqala (former arsenal) of the kasbah, the streets where are arranged so many stalls that we discover during a long walk ... free lunch and late afternoon, we will take the road to Marrakech. Dinner and overnight at the hotel. After breakfast start the visit of the southern Berber capital, visit the Majorelle Gardens, visit the minaret of Koutoubia, a real symbol of the city, then visit the Ben Youssef Madrasa, Koranic theology school founded in the fourteenth century and rebuilt by the Saadians. We will then discover the tombs of the Saadian princes and the El-Badi palace, built in the 16th century by the sultan Moulay Ahmed el-Mansour. We will discover the Bahia Palace, built in the last century by Si Moussa. After lunch, we will visit the Dar Si Said, a charming little palace of the nineteenth century that houses the Museum of Moroccan Art. Free lunch, then free time on the place Jemaa el-Fna with extraordinary animation. Dinner and overnight in Marrakech. After breakfast, departure to Oukaimeden, break on Ourika, then continue to the main ski resort, free lunch on site, then departure to Casablanca, check in, free evening and dinner & overnight at the hotel. Transfer to Casablanca airport according to flight schedules.